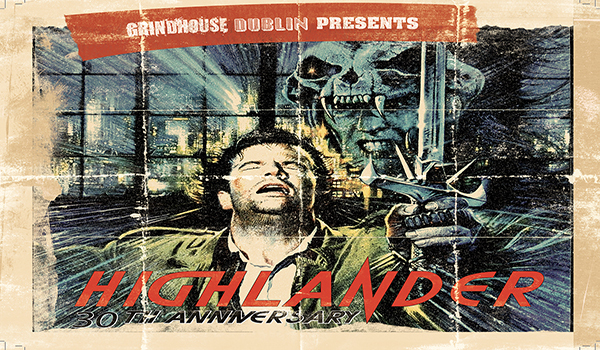 Grindhouse Dublin celebrates the 30th Anniversary of the immortal 80’s classic ‘Highlander’, starring Christopher Lambert and the legendary Sean Connery on Friday 26th August! There can be only one (screening)! Needing no introduction for fans of 80’s action cinema, this cult favourite has grown in stature over the years. Although not an initial success on its release, Highlander is now considered a benchmark of 80’s action adventure films, spawning no less than 4 sequels, as well as a TV series and acclaimed anime. Prepare to feel the quickening in this visually stunning film, which, along with a thrilling soundtrack by rock gods Queen, is sure to blow you to the back of the cinema!